If you ever spent hours on the Etch-a-Sketch and thought that what it could really use was a dual-core processor, check out the video below. It's The Sandbox, an iOS hit game that's headed for Android soon. Well, "game" may not be the right word - it's more of a simplistic art/animation/music engine that happens to be played like a game. You take on the role of "apprentice deity" and get to play with the classical elements, completing simple missions or moving freestyle on the face of the waters. The art style is decidedly pixelated, with some of the mix-and-match creation elements inspired by games like Alchemy. While you can color inside the lines with the assigned tasks or play nice with the environmental tools, you can also embrace your godliness Old Testament-style and generally wreck the place. Creations can be saved for tinkering later, and posted to the online gallery to show off to your all-powerful peeps. 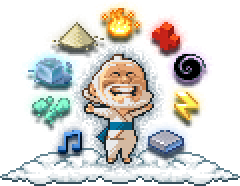 According to developer Pixowl, The Sandbox will be available on Android by the end of February. If it follows the iOS version, it should be a free download.